This Project presents an automotive localization system using GPS and GSM-SMS services. The system permits localization of the automobile and transmitting the position to the owner on his mobile phone as a short message (SMS) at his request. The system can be interconnected with the car alarm system and alert the owner on his mobile phone. 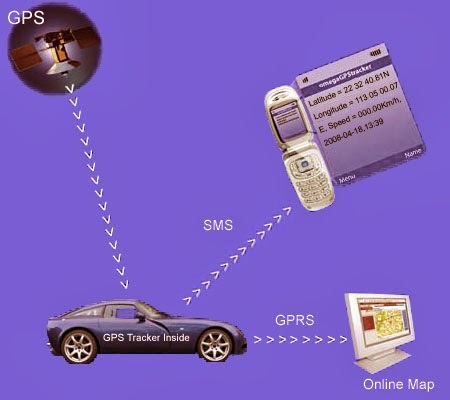 This tracking system is composed of a GPS receiver, Microcontroller and a GSM Modem. GPS Receiver gets the location information from satellites in the form of latitude and longitude. The Microcontroller processes this information and this processed information is sent to the user/owner using GSM modem. Microcontroller also gets the speed of the vehicle and sends it to user/owner. The presented application is a low cost solution for automobile position and status, very useful in case of car theft situations, for monitoring adolescent drivers by their parents as well as in car tracking system applications. The proposed solution can be used in other types of application, where the information needed is requested rarely and at irregular period of time (when requested). This system is also can be interfaced with Vehicle airbag system. This enable it to monitor the accident situations and it can immediately alerts the police/ambulance service with the location of accident.